Tags: "Latest Hubble Measurements Suggest Disparity in Hubble Constant Calculations is not a Fluke", Astronomy ( 7,565 ), Astrophysics ( 4,700 ), Basic Research ( 10,465 ), Cosmic distance ladder, Cosmic Microwave Background - CMB, Cosmology ( 4,891 ), Hubble’s measurements of today’s expansion rate do not match the rate that was expected based on how the Universe appeared shortly after the Big Bang over 13 billion years ago., NASA ESA Hubble ( 540 ), The Large Magellanic Cloud, To get accurate distances to nearby galaxies the team then looked for galaxies containing both Cepheids and Type Ia supernovae, Using new data from the NASA/ESA Hubble Space Telescope astronomers have significantly lowered the possibility that this discrepancy is a fluke. Hubble’s measurements of today’s expansion rate do not match the rate that was expected based on how the Universe appeared shortly after the Big Bang over 13 billion years ago. Using new data from the NASA/ESA Hubble Space Telescope, astronomers have significantly lowered the possibility that this discrepancy is a fluke. This animation shows the principle of the cosmic distance ladder used by Adam Riess and his team to reduce the uncertainty of the Hubble constant.For the calibration of relatively short distances the team observed Cepheid variables. These are pulsating stars which fade and brighten at rates that are proportional to their true brightness and this property allows astronomers to determine their distances. The researchers calibrated the distances to the Cepheids using a basic geometrical technique called parallax. With Hubble’s sharp-eyed Wide Field Camera 3 (WFC3), they extended the parallax measurements further than previously possible, across the Milky Way galaxy. To get accurate distances to nearby galaxies, the team then looked for galaxies containing both Cepheids and Type Ia supernovae. Type Ia supernovae always have the same intrinsic brightness and are also bright enough to be seen at relatively large distances. By comparing the observed brightness of both types of stars in those nearby galaxies, the team could then accurately measure the true brightness of the supernova. Using this calibrated rung on the distance ladder the accurate distance to additional 300 type Ia supernovae in far-flung galaxies was calculated. Using new observations from the NASA/ESA Hubble Space Telescope, researchers have improved the foundations of the cosmic distance ladder, which is used to calculate accurate distances to nearby galaxies. This was done by observing pulsating stars called Cepheid variables in a neighbouring satellite galaxy known as the Large Magellanic Cloud, now calculated to be 162,000 light-years away. When defining the distances to galaxies that are further and further away, these Cepheid variables are used as milepost markers. Researchers use these measurements to determine how fast the Universe is expanding over time, a value known as the Hubble constant. Before Hubble was launched in 1990, estimates of the Hubble constant varied by a factor of two. In the late 1990s the Hubble Space Telescope Key Project on the Extragalactic Distance Scale refined the value of the Hubble constant to within 10 percent, accomplishing one of the telescope’s key goals. 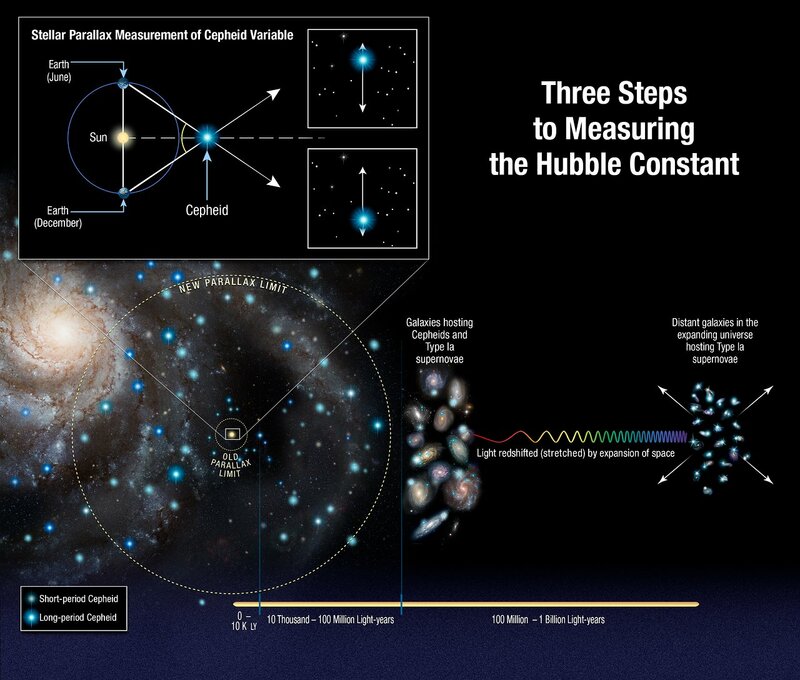 In 2016, astronomers using Hubble discovered that the Universe is expanding between five and nine percent faster than previously calculated by refining the measurement of the Hubble constant and further reducing the uncertainty to only 2.4 percent. In 2017, an independent measurement supported these results. This latest research has reduced the uncertainty in their Hubble constant value to an unprecedented 1.9 percent. This research also suggests that the likelihood that this discrepancy between measurements of today’s expansion rate of the Universe and the expected value based on the early Universe’s expansion is a fluke is just 1 in 100,000, a significant improvement from a previous estimate last year of 1 in 3,000. As the team’s measurements have become more precise, their calculation of the Hubble constant has remained inconsistent with the expected value derived from observations of the early Universe’s expansion made by the European Space Agency’s Planck satellite. These measurements map a remnant afterglow from the Big Bang known as the Cosmic Microwave Background [CMB], which help scientists to predict how the early Universe would likely have evolved into the expansion rate astronomers can measure today. The new estimate of the Hubble constant is 74.03 kilometres per second per megaparsec . The number indicates that the Universe is expanding at a rate about 9 percent faster than that implied by Planck’s observations of the early Universe, which give a value for the Hubble constant of 67.4 kilometres per second per megaparsec. 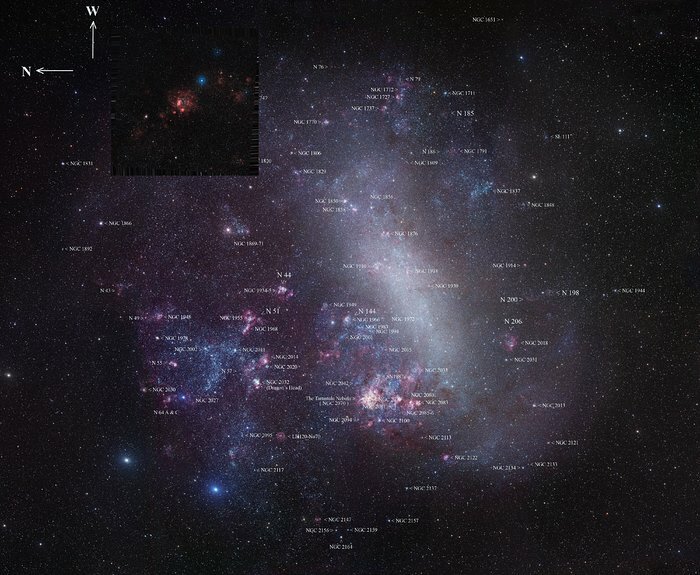 To reach this conclusion, Riess and his team analysed the light from 70 Cepheid variables in the Large Magellanic Cloud. Because these stars brighten and dim at predictable rates, and the periods of these variations give us their luminosity and hence distance, astronomers use them as cosmic mileposts. Riess’s team used an efficient observing technique called Drift And Shift (DASH) using Hubble as a “point-and-shoot” camera to snap quick images of the bright stars. This avoids the more time-consuming step of anchoring the telescope with guide stars to observe each star. The results were combined with observations made by the Araucaria Project, a collaboration between astronomers from institutions in Europe, Chile, and the United States, to measure the distance to the Large Magellanic Cloud by observing the dimming of light as one star passes in front of its partner in a binary-star system. Because cosmological models suggest that observed values of the expansion of the Universe should be the same as those determined from the Cosmic Microwave Background, new physics may be needed to explain the disparity. “Previously, theorists would say to me, ‘it can’t be. It’s going to break everything.’ Now they are saying, ‘we actually could do this,’” Riess said. Various scenarios have been proposed to explain the discrepancy, but there is yet to be a conclusive answer. An invisible form of matter called dark matter may interact more strongly with normal matter than astronomers previously thought. Or perhaps dark energy, an unknown form of energy that pervades space, is responsible for accelerating the expansion of the Universe. Although Riess does not have an answer to this perplexing disparity, he and his team intend to continue using Hubble to reduce the uncertainty in their measure of the Hubble constant, which they hope to decrease to 1 percent. This means that for every 3.3 million light-years further away a galaxy is from us, it appears to be moving about 74 kilometres per second faster, as a result of the expansion of the Universe. Tags: "Mystery of the Universe's Expansion Rate Widens with New Hubble Data", Astronomers have already hypothesized that dark energy existed during the first seconds after the big bang and pushed matter throughout space starting the initial expansion., Astronomy ( 7,565 ), Astrophysics ( 4,700 ), Basic Research ( 10,465 ), Cepheid variables in the Large Magellanic Cloud, Cosmic distance ladder, Cosmology ( 4,891 ), Dark energy may also be the reason for the universe's accelerated expansion today., DASH (Drift And Shift) using Hubble as a "point-and-shoot" camera, ESA/Planck 2009 to 2013 ( 2 ), Hubble Constant ( 6 ), NASA ESA Hubble ( 540 ), Proposed by astronomers at Johns Hopkins the theory is dubbed "early dark energy" and suggests that the universe evolved like a three-act play., Standard candles ( 5 ), The new estimate of the Hubble constant is 74 kilometers (46 miles) per second per megaparsec., The new theory suggests that there was a third dark-energy episode not long after the big bang which expanded the universe faster than astronomers had predicted., The true explanation is still a mystery. To look at the minuscule fluctuations on all scales in the leftover glow from the Big Bang — the Cosmic Microwave Background — and to reconstruct the Universe’s composition and expansion history from that. The Gaia Deployable Sunshield Assembly (DSA) during deployment testing in the S1B integration building at Europe’s spaceport in Kourou, French Guiana, two months before launch. Image credit: ESA-M. Pedoussaut. Interestingly enough, these two methods disagree by a significant amount, and the European Space Agency’s GAIA satellite, poised for its first data release tomorrow, September 14th, intends to resolve it one way or another. Image credit: ESA and the Planck Collaboration, of the best-ever map of the fluctuations in the cosmic microwave background. The leftover glow from the Big Bang is only one data set, but it’s perhaps the most powerful data set we could have asked for nature to provide us with. It tells us the Universe expands with a Hubble constant of 67 km/s/Mpc, meaning that for every Megaparsec (about 3.26 million light years) a galaxy is apart from another, the expanding Universe pushes them apart at 67 km/s. The Cosmic Microwave Background also tells us how the Universe has expanded over its history, giving us a Universe that’s 68% dark energy, 32% dark-and-normal matter combined, and with an age of 13.81 billion years. Beginning with COBE and heavily refined later by BOOMERanG, WMAP and now Planck, this is perhaps the best data humanity has ever obtained for precision cosmology. The construction of the cosmic distance ladder involves going from our Solar System to the stars to nearby galaxies to distant ones. Each “step” carries along its own uncertainties. Image credit: NASA,ESA, A. Feild (STScI), and A. Riess (STScI/JHU). We needed to learn how to measure Solar System distances, which took the developments of Newton and Kepler, plus the invention of the telescope. We needed to learn how to measure the distances to the stars, which relied on a geometric technique known as parallax, as a function of Earth’s motion in its orbit. We needed to learn how to classify stars and use properties that we could measure from those parallax stars in other galaxies, thereby learning our first galactic distances. And finally, we needed to identify other galactic properties that were measurable, such as surface brightness fluctuations, rotation speeds or supernovae within them, to measure the distances to the farthest galaxies. This latter method is older, more straightforward and requires far fewer assumptions. But it also disagrees with the Cosmic Microwave Background method, and has for a long time. In particular, the expansion rate looks to be about 10% faster: 74 km/s/Mpc instead of 67, meaning — if the distance ladder method is right — that the Universe is either younger and smaller than we thought, or that the amount of dark energy is different from what the other method indicates. There’s a big uncertainty there, however, and the largest component comes in the parallax measurement of the stars nearest to Earth. The parallax method, employed by GAIA, involves noting the apparent change in position of a nearby star relative to the more distant, background ones. Image credit: ESA/ATG medialab. This is where the GAIA satellite comes into play. Outstripping all previous efforts, GAIA will measure the brightnesses and positions of over one billion stars in the Milky Way, the largest survey ever undertaken of our own galaxy. It expects to do parallax measurements for millions of these to an accuracy of 20 micro-arc-seconds (µas), and for hundreds of millions more to an accuracy of 200 µas. All of the stars visible with the naked eye will do even better, with as little as 7 µas precision for everything visible to a human through a pair of binoculars. A map of star density in the Milky Way and surrounding sky, clearly showing the Milky Way, large and small Magellanic Clouds, and if you look more closely, NGC 104 to the left of the SMC, NGC 6205 slightly above and to the left of the galactic core, and NGC 7078 slightly below. Image credit: ESA/GAIA. GAIA was launched in 2013 and has been operational for nearly two full years at this point, meaning it’s collected data on all of these stars at many different points in our planet’s orbit around the Sun. Obtaining parallax measurements means we can get the full three-dimensional positions of these stars in space, and can even infer their proper motions at these accuracies, meaning we can dramatically reduce the uncertainties in the distances to the stars. What’s most spectacular is that many of these stars will be of the same types that we can measure in other star clusters and galaxies, enabling us to build a better, more robust cosmic distance ladder. When the GAIA results come out — and have been fully analyzed by the astronomical community — we’ll have our best-ever understanding of the Universe’s expansion history and of the distances to the farthest galaxies in the Universe, all because we measured what’s happening right here at home. Right now, the Cosmic Microwave Background and the cosmic distance ladder are giving us two different answers to the question of the age, expansion rate and composition of our Universe. They’re not very different, but the fact that they disagree points to one of two possible things. Either one (or both) of the measurements are in error, or there’s a fundamental tension between these two types of measurement that might mean our Universe is a funnier place than we’ve realized to date. When the results from GAIA come out tomorrow, the great hope of most astronomers is that the previous parallax measurements will be shown to have been in error, and our best understanding of the Universe will hold up and be vindicated. But nature has surprised us before, and — if you’re hoping for something new — keep in mind that it just might do so again.